Since buying our house three years ago, it’s grown increasingly cluttered and dirty. 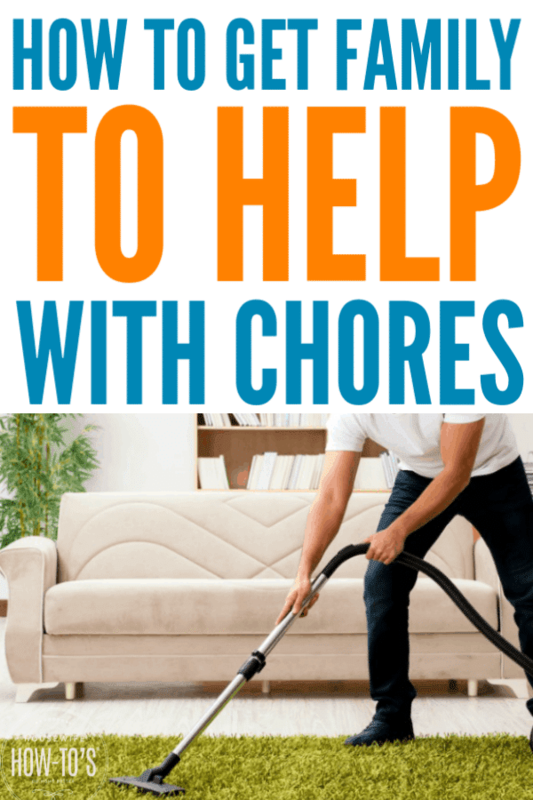 I try my best to keep up with housework, but as a SAHM with two kids (3 and 5), plus a messy husband who comes home and flops in front of the television, it’s hard to do! This year I made a New Year’s resolution to get the house clean and toss some of the clutter, and then KEEP it that way. But here we are barely a week into the New Year, and I’m already struggling. How do I make my husband help out more? And is it unrealistic to expect children my kids’ age to pitch in, too? Before I tell you the answer, I want you to take a deep breath and let it out slowly. Better? Good, now sit down because you’re probably not going to like this. You can’t MAKE your husband help out more. (Take another deep breath, woman.) Remember, this was your New Year’s Resolution, not his. If you’d resolved to lose 10 lbs (and I’m not saying that you need to), you wouldn’t expect him to do that for you, would you? Of course not. I say this from experience. I spent the first decade of marriage trying to nag my sloppy, pack rat husband into performing various chores. Our kids weren’t any better at pitching in. Trying to change them nearly drove me crazy, too. Over the years, I learned a few things — like how to make a fabulous martini to reward myself at the end of the day. I also learned that screaming at my husband and kids doesn’t make them change in any meaningful fashion. But you CAN make him want to help. That said, there are ways to get family to help with chores that will lighten your load you’ve chosen to carry. And there are benefits for them, too. Spouses who help around the house do better at work and kids who do chores do better later in life. But remember: when you set standards for how clean you want your home to be, you are choosing the size of your burden. These steps worked with my family. Being a stay-at-home mom doesn’t mean that you are your husband’s maid. For one thing, maids have set working hours and get time off, but SAHMs don’t. Keeping the house clean shouldn’t be entirely your responsibility. Your husband isn’t one of the kids you stayed home to raise. Plus, there are some things you need an extra set of hands or muscles to accomplish. Don’t give him a reason to rush. I used to ask my husband to spend an hour or so on Sundays helping me before football started. Know what happened? He’d rush through whatever I’d asked him to do, usually doing only a part of it. Then he would plant himself in front of the TV. You can imagine my mood for the rest of the day. Don’t ambush him at the door. Being home all day with the kids can be draining. Having to keep mental track of a To Do list adds to that stress. Sometimes, we SAHPs forget our spouses come home with their own mental fatigue. They need a chance to unwind before being asked to do stuff around the house. Give him a half-hour to change and play with the kids. I bet you’ll find he’s more open to helping. Whether we like it or not, as children grow up, girls usually receive more homemaking instruction. In other words, you’re already at an advantage when it comes to knowing what to do and how. 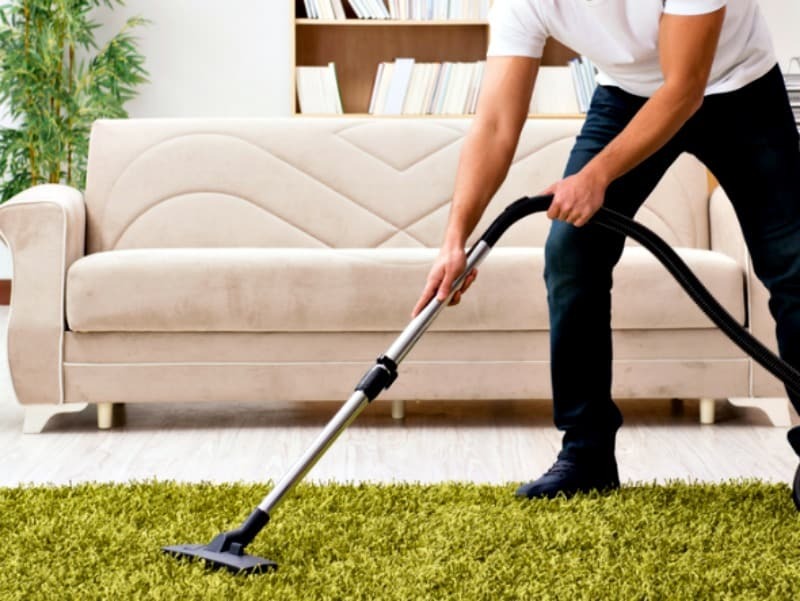 Asking your husband to “clean the family room” may mean, in his mind, picking up trash. Meanwhile, you think he should also dust the tables, take the empty dishes to the sink, and give the floor a quick vacuum, too. Spell it out for him — simply. Hand him one of my printable house cleaning checklists. Reading the steps for himself means you don’t have to nag him, and he’ll know everything he needs to do. As silly as it is, it makes a man nervous to go out of his comfort zone to do a chore he wasn’t raised knowing how to do. Your praise lets him know that you realize he helped and that he did it right (even if he didn’t). I’m not saying you need to throw a parade, but a cheery “Thank you so much!” encourages him to keep pitching in around the house. 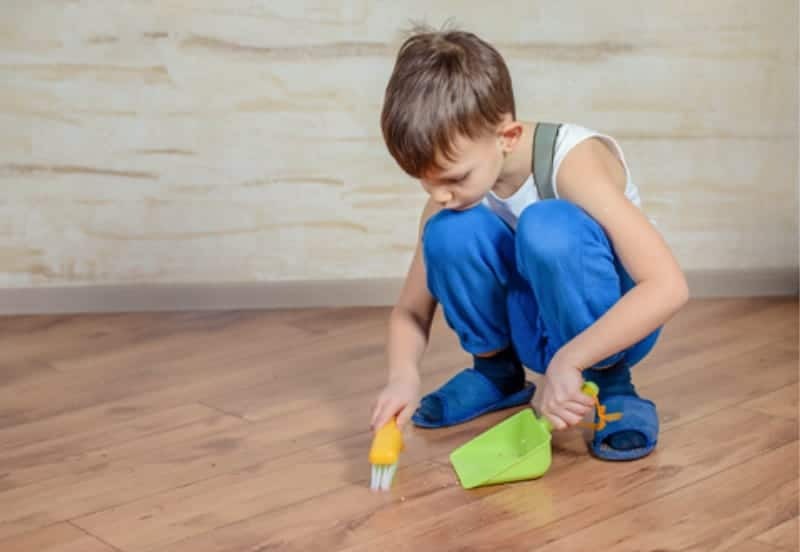 If you’re raising boys, do the next generation a favor: get your sons involved in housework! You’ll be teaching valuable life skills they’ll need as adults, and helping them avoid domestic friction when they’re married someday. As soon as kids can walk they should have “chores,” even if it’s just putting their toys away before naptime. This teaches them that being part of a family means pitching in. A clean, cozy house benefits everyone. As for which tasks to give the kids, check out this list of chores kids can do and decide what your little ones are ready to handle. Good luck, Screaming Mom, and try to keep it all in perspective. Your kids will get better about picking up after themselves! UPDATE (8/12/2013): Screaming Mom sent a follow-up email! I wish I could give you a big hug! When I first wrote to ask for your help I wasn’t very fond of your answer. It seemed like you were telling me to either be okay with my house being messier or shut up and do it myself. I just want to apologize for all the names I called you that day and for days after that. But even though I didn’t like your advice I followed it at least with respects to my husband. I wrote on the family calendar what I’d be cleaning each day and after he watched a show or two on TV after work, he started helping me with anything I hadn’t finished. You told me to gush with praise whenever he helped and I did. He liked that so he started helping even more. The kids saw Daddy helping Mommy clean and getting treats for it (I started baking cookies and things) and they began helping me too. Now we all spend a half hour or so cleaning together every evening after dinner and before our bath and book time. My house looks better than it ever has. I’m sorry it’s taken me so long to write back and let you know how we turned out. It’s just that we had such a great spring and summer together, including vacations and visits from family that didn’t send me into a tantrum because my house was clean already! Thank you SO MUCH, Katie! You are my hero. They had the option to either continue living without or do their chores EVERY day for a week and then start earning things back — with the TV and computer being the last things they earned. It was a miserable week for all of us, but after the first couple of days their tantrums subsided. I still wouldn’t give things back. By the end of the week, they were literally begging for chores to earn things back faster. My house quickly started to look immaculate. After that, when they’d start slacking off I only had to mention taking away things before they’d hop up and do their chores without arguing. 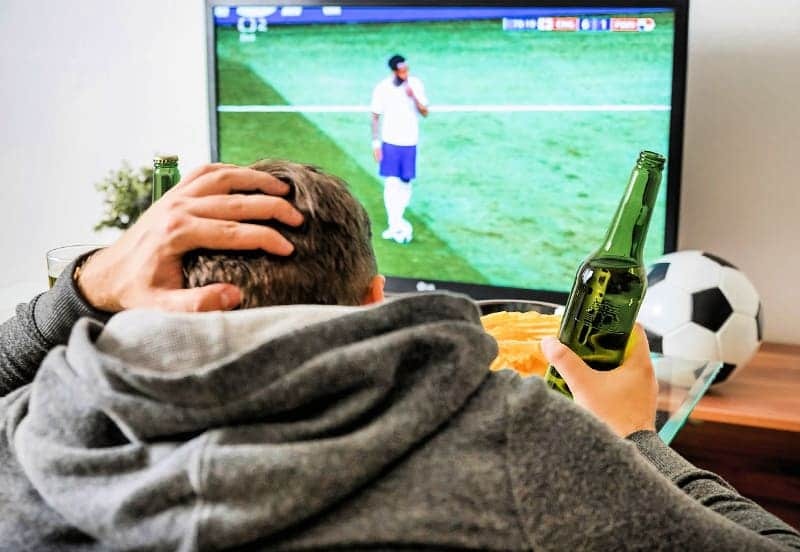 By the time they were in their early teens, helping around the house had become a habit and they knew they would get NO privileges or fun money if they did not. Only YOU know how your kids would respond, and how much blowback you can handle from them, but I do sympathize with feeling like you’ve lost control of your home, so maybe try this or a similar method to reclaim it. Best wishes to you! I loved all the advice but, that’s all it was. I wish you could have seen my husband’s face when I asked for help. His response “I work at a job all week”! My husband and teenage sons spend every free minute on their computer’s. Just wanted to say that I totally got where screaming mom was coming from! I have the same situation almost exactly, except I may have less time at home. I do kinder runs every day with my kids on foot due to only having one car which my husband needs for work (roll on getting a 2nd car sometime in the next month!). This takes around 2 hours per day due to where we live. I volunteer at the kinder and in the local community doing environmental education and I’m studying part-time evenings, so I’m squeezing school work in where possible. Before I started school I was given assurances that he would do what he could to support me and help out, but recently there was a huge fight over the bathroom (I got fed up cleaning it and decided to pretend I couldn’t see the mess to see how long it took before anyone noticed… almost a year!!!) and I was told that he expected me to do everything as he was “at work all day”. When I pointed out that I wasn’t exactly sitting on my backside I got the “well you’ve obviously taken on too much” response… yep. I made the mistake of taking on a husband!! Thing is, he’s a wonderful man and a fantastic father. I couldn’t ask for better and I love him with all my heart, but he seems oblivious to what is involved in our daily lives. So, thanks to this website I’m putting everything I do down in writing as daily tasks, weekly tasks etc and putting them up on the wall where he can’t fail to see them. I’ve also allocated some to him to deal with in the evenings, nothing major but stuff that either I can’t do as I’ll be at school or studying. Plus I’m booking in some regular ME time at the weekends!!! I think once you started school yourself it was only fair for the family to revisit the division of household tasks. 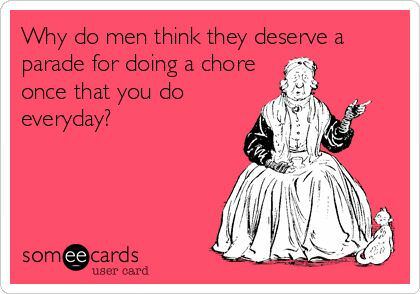 It’s one thing when a woman has left the workforce to work at home, as I have, with the knowledge that the vast majority of household chores will fall to her. It’s an entirely different thing when a woman is in school or working. I can only imagine how frustrated you must have felt, putting in time in class and time on homework, and feeling like those commitments weren’t being taken into consideration. After all, YOU were “at work all day” just like him! I’m very pleased that my cleaning checklists and other tips are helping you. Please do make a point of budgeting in time for YOU when you can. You deserve it! Good luck with your men. Needless to say, I’m making a point to teach my son to clean well. I figure his future wife will have plenty of other reasons to dislike me, but this topic doesn’t need to be one. Your future daughter-in-law will be grateful for your efforts! I must be one of the lucky ones!! My hubby has always ‘helped out’. Sometimes not in ways I really wanted him to, but I still had to appreciate it so he would eventually do the things that were really helpful!! *L* Since I’ve gotten sick he has really stepped forward and I can’t say enough good about that! I agree with your hints, though, especially timing it right. Most men will do most anything if they think it was their idea in the first place! LOL Yes, if we put the notion in their heads they’ll run with it. I had to chuckle at your husband’s initial efforts to be helpful. Mine was the same way, and for years I wondered if he’d intentionally messed things up so I wouldn’t ask for his help anymore. Then I realized he just had no idea how to clean!